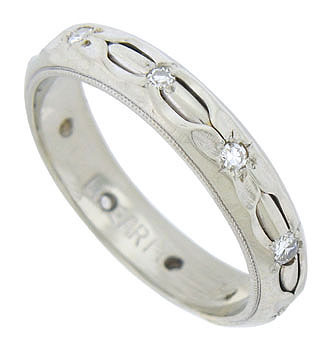 Abstract floral mountings set with brilliant diamonds, adorn the surface of this vintage 14K white gold wedding band. Openings in the ring give glimpse of a strong vine connecting each dazzling bloom. 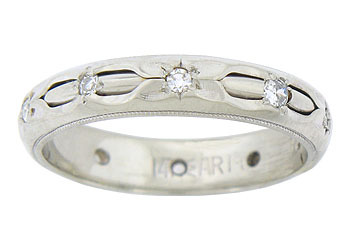 The edges of the ring are adorned with strings of delicate milgrain decoration. 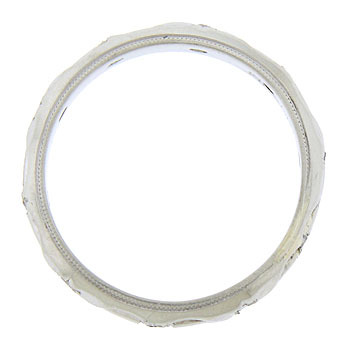 The Retro Modern wedding ring measures 3.89 mm in width. Circa: 1940. Size 6 1/4. We cannot re-size.